Ujjayi Pranayam is practiced with both nostrils open, by producing a snoring sound during inhalation and exhalation. This sound is produced due to adduction of vocal cords. i.e. they come near each other, so that air of inhalation and exhalation produce the snaring sound. During this practice, inhalation and exhalation are done by thoracic breathing. Thoracic breathing leads to expansion of ribcage in transverse and front to back dimensions. Inhalation should be deep and exhalation should be deliberately prolonged. 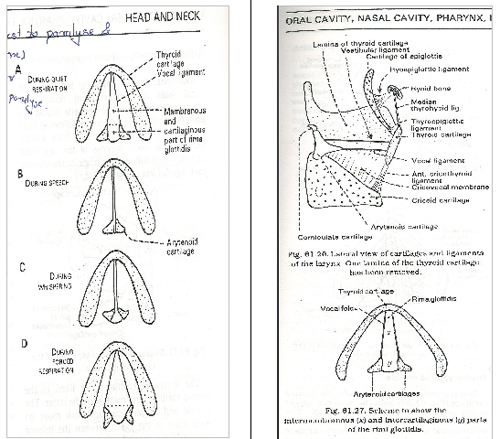 Larynx is also called voice box, as voice – (sound) is produced here. It is produced by vibrations of vocal cords present in it. Vocal cords are tough white tendinous cords converging in front & separating behind. They are attached to tiny cartilages, behind, called arytenoids & in front to thyroid cartilage. Intrinsic muscles are responsible for adduction (coming near) abduction (going away) of vocal cords in their front and back part as the need arises. e.g. during speech they come near each other. These muscles have nerve supply by branch of vagus nerve. Vagus nerve also carries afferent fibres(receiving impulses) from larynx. Attention to inhalation and exhalation to deepen & prolong respectively. This reduces resting breathing rate. Reduction in breathing rate increases vagal tone. Afferent impulses are carried by vagal fibers to reach its center. Study of Dharana with breath as an ‘Aalamban’, (To concentrate at) helps us for Dhyana Practice.